Measure absolute or gauge pressure at any point in your closed process volume, and control flow at a different point to ensure your pressure stays on target. 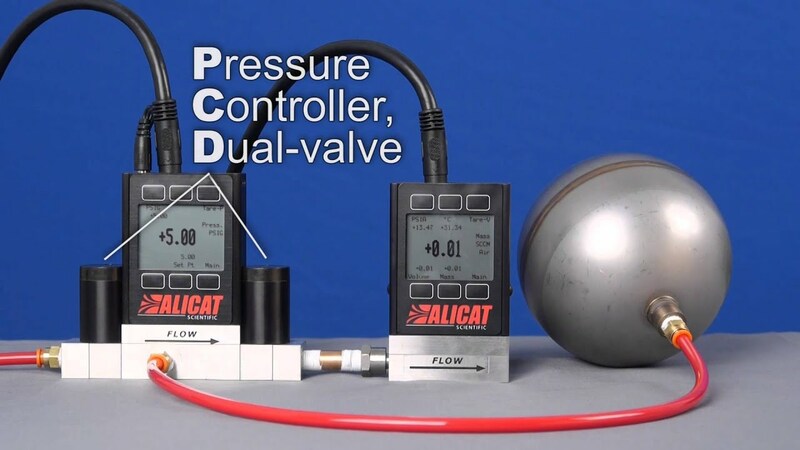 Alicat’s PCD3 series dual-valve pressure controllers use two proportional valves to precisely control the pressure of gases within dead-ended volumes and physically isolates the pressure sensor from the valve and flow path so that you can control pressure exactly where you need it. This allows pressure control in areas where you cannot easily install a full pressure controller and reduces the effects of flow-induced pressure changes in high-flow applications. We’ll use your application parameters to customize your valve and PID tuning to ensure that your controller delivers fast and stable control. Efficient. The dual-valve design incorporates a second proportional valve to exhaust excess pressure, but only when needed to maintain your setpoint. This eliminates the need to continuously bleed costly gas. Plumb the pressure sense port wherever you need to control pressure. Compatible gas media: all non-corrosive gases (PCD3/PCD3S). Liquids and corrosive gases require an S-series device (PCD3S). Instruments in the standard PCD3 series are also available with an optional “S” configuration (PCD3S) for use with liquids and corrosive gases. In this configuration, we upgrade the valves to 303 stainless steel, the sensor to 316L stainless steel and the elastomers to FFKM. Some corrosive gases require 316L stainless steel throughout the flow path, and in this case we can upgrade both the valves (type PCA) and flow body to 316L for full-scale flow ranges of 20 slpm or less. Alicat’s PCD3 series uses small proportional valves for control at lower flow rates and is suitable for use with non-corrosive gases. Alicat’s PCDP3 series offers the largest orifice in a small valve format and is suitable for use with non-corrosive gases. Alicat’s PCDH3 series pairs two small valves working side-by-side as one and is suitable for use with non-corrosive gases. Alicat’s PCRD3 series uses nearly frictionless Rolamite valves and a variety of orifice patterns for control at high flow rates and is suitable for use with non-corrosive gases. Alicat’s PCDS series uses small proportional valves for control at lower flow rates and is suitable for use with liquids and corrosive gases. Alicat’s PCDH3S series is suitable for use with liquids and corrosive gases and pairs two valves working side-by-side as one to provide greater control at higher pressures. Alicat’s PCRD3S series is suitable for use with liquids and corrosive gases and uses nearly frictionless Rolamite valves and a variety of orifice patterns for control at high flow rates. When flow rates entering or leaving a closed volume are high, flow-induced pressure drop can cause inaccurate pressure measurements. The PCD3’s remote sense port accurately monitors the pressure in the closed volume, no matter the flow rate.